As reports surfaced that the Alliance of American Football would suspend all league operations, its teams — including the San Diego Fleet — were left in a state of limbo. SAN DIEGO (KGTV) — As reports surfaced that the Alliance of American Football would suspend all league operations, its teams — and fans — were left in a state of limbo. 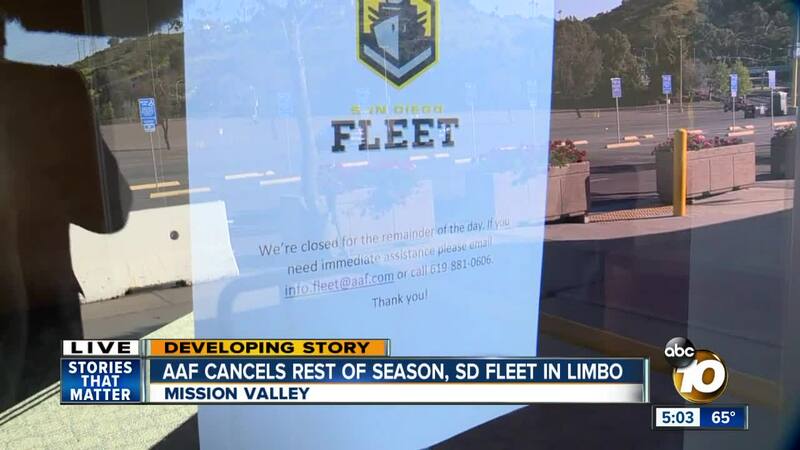 Fans searching for tickets to the San Diego Fleet's April 14 game at SDCCU Stadium against the Arizona Hotshots were met with a screen reading, "Oh-no! These tickets went fast and we're unable to find more right now." Calls to season ticket lines and links on the team's website went unanswered and returned no results Tuesday. A note was also left on the team's office door at SDCCU Stadium reading, "We're closed for the remainder of the day." According to the team's general manager, Tuesday practice had been canceled, but no further statement on the league's reported decision was given. The Fleet, as well as the AAF's seven other teams, had played eight of 10 regular season games slated for the league's inaugural season. According to The Action Network's Darren Rovell , AAF Chairman Tom Dundon had funded the league week-to-week and will lose about $70 million of his investment. Tuesday's decision was reportedly made against the wishes of league co-founders Charlie Ebersol and Bill Polian. The league had reportedly hoped to become a developmental league in partnership with the NFL. Through eight games, the Fleet held a 3-5 record and was tied for third in the four-team Western Conference. Three of four games already held at SDCCU Stadium drew more than 20,000 in attendance.